November 14, 2018 at 6:30 pm. This demonstration is free and open to the public. George Herrick has been drawn to creative expression since early childhood. He is a painter, life coach, writer, ceremonialist and retreat leader, all in service to creative expression. Recognizing the creative essence in everyone, George has dedicated his life to helping people draw out their innate, divinely given gifts into the world. The Newington Art League members will have a display of their work in the Community Room at the Lucy Robbins Welles Library in Newington from October 1 through October 31, 2018. There will be an opening reception on Saturday, October 6th from 1 – 3 pm. 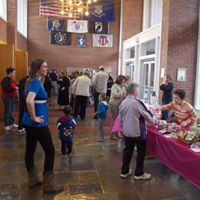 The 2018 Members Spring Show is scheduled for April 16 – May 17 in the Newington Town Hall Lobby. This show is in conjunction with the student art exhibit on the third floor of the town hall. Participation is open to all current Newington Art League members and is usually judged (judge yet to be determined) with cash prizes awarded. The entry fee is $10 per piece and members may submit two pieces each. The $10 per piece entry fees collected for the show allow us to pay a judge and help to fund our Newington Art League. The drop-off will be Monday, April 16 from 1-2 pm, reception/bake sale will be Thursday, April 19th at 5:30 pm. The pick up date will be Thursday, May 17 from 2-3 pm.